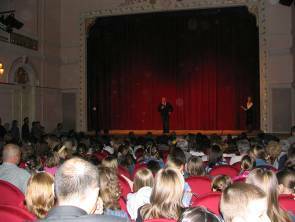 book” contest came to the close of its first round at the prize giving ceremony at the city theatre in Karlovac. pointed star with a deep moat around its walls at the intersection of four rivers. At the centre on a smaller six pointed star all the schools assembled and introduced each other. After that they had some free time to stroll around and see the exhibition of the books by children. We had a beautiful artistic display of the 150 best books and of course a table with the newly five published books for sale. In the early evening, the theatre was full to the brim with about 400 people and children. The programme started with the Zorin Dom children’s ballet performing “Ples igracaka” (The Dance of Toys) – the winning story of the 14 year old Masa Lenuzzi from Karlovac. It was a lovely fresh simple and wonderful story line, well choreographed with lots of little elves and toys dancing among the main ballet characters. The stage was an explosion of children’s joy to dance and perform and the same for the audience to watch it! Lukrecia and Armin, two young members of our Kuku (klub za kreavno ucenje- creative learning club) of CNS presented a PowerPoint of some images from the 335 books that came from 40 different places in Croatia. It was wonderful to see how children wrote and illustrated. The slides started with themes of Children’s Rights where children expressed their thoughts and feelings. One book was titled “My father has improved” and had an image of him drinking. Next were images of children’s sensitivity and care for animals and nature. And lots of fantasy and adventure stories! 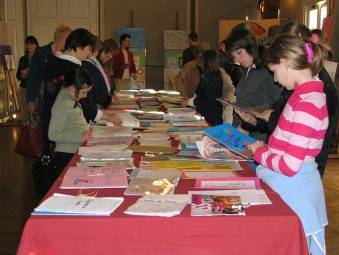 Some authors got special mention, such as the youngest who was only 6 1/2, one who lost her book and wrote it again and two who submitted two books!Children’s choir “Cicibani” – were lots of kids bursting to sing, ages kindergarten and above – they brought the most laughter to the audience with their childlike presence. The whole theatre was alive! 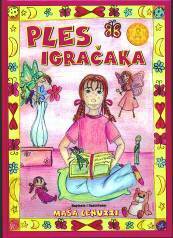 ‘Ples Igracaka’ (Dance of Toys) is from Masa Lenuzzi, she is 14 and from the oldest age group. Her story was made into a ballet play by the children’s ballet from Karlovac and is now going to other cities in Croatia! 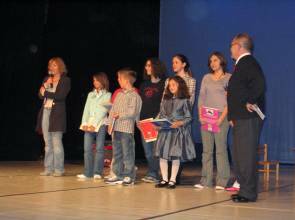 Grade2 winners with Sanja Pilic and Tito Bilopavlovi, popular children’s litterateurs. Zagreb… and lots more enthusiasm and plans for the future.Here is the text of the book of the youngest winner a boy of 9 years. It is a translation into English. He made beautiful tempera paintings for each line. The sea is like a big blue child. It likes to play and tumble. It can sleep peacefully, yet it can get angry at times. my problems and everything that I like. I tell it how much I like its waves, little fishes, crabs and shells. I wish I could dive into its blue depths and discover all its secrets. I wish it could carry me on a wave to some far away place. and its murmur puts me to sleep in the evening. It reveals my secrets to nobody, neither to the wind, nor to the seagulls. That is why I love it so very much, because we are both alike. And when we have to part, it gives me its most beautiful shell. When I press it against my ear, I hear the sea whispering the secrets that I alone know. 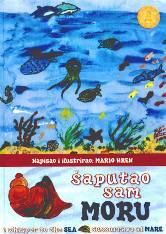 ‘Saputao sam moru’ (I whisper to the sea) by the youngest winner Mario Hren, 9 years old. This book is in English and Italian. A page from his book. 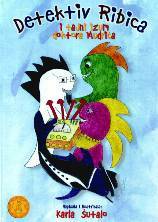 The winning books are for sale from Didi Anandarama. Price is 10 Euro plus postage.